I'm not sure about you but the bag I lug around seems to get heavier and heavier - I have a tendency to blame my notebook computer for much of the weight so today I took a look at what was in my bag. It is loaded with folders full of paper. Here's a shot of what I pulled out this morning - I don't have a scale handy but I'm guessing there is at least ten pounds of paper here. A quick scan of what's in the picture indicates I could lighten up about 90 percent of the pile - around 9 pounds - if I moved the stuff I've printed out to various electronic forms to read, annotate and file. If I make an effort could I go without paper? Maybe. I currently carry an iPhone, an Amazon Kindle and a 13 inch MacBook. I think I've got a nice combination that I can conscientiously work with to lighten my paper load. Goes in my shirt pocket, not my bag. Use for email and web browsing when not near a PC. Also on the fly viewing of email attached Word documents, spreadsheets, PDF's, etc. the power adapter weighs .71 pounds. I also carry an optical mouse that weighs 5.2 ounces. Use for email, web browsing, document editing, podcasting etc when convenient. Power adapters and cables for the iPhone and Kindle add another 6 or so ounces - adding the major electronic devices up I come up with about 7 pounds in my bag. I also carry a composition book for taking handwritten notes and a bunch of pens and pencils, a laser pointer/slide clicker, 3 or 4 thumb drives, etc adding maybe another pound. Some things I cannot get electronically (at least not yet), including many of the magazines/journals I read - they add another half a pound or so. Summing it all up I'm looking at about 9 pounds without any extra paper documents and....... I could stop blaming my notebook computer - not bad! I'll write about my project progress every once in a while over the summer and will be sure to include a picture or two. Good luck with this Gordon. I think this will be an interesting experience because will you empty your bag of paper and put in other things? Or will you keep the bag empty of most papers? The other thing to note is how your back, shoulder, and neck don't hurt as much because of the bag you are carrying. Hi Mark - now you got me thinking - I may start tracking the weight of my bag! Your blog created a lot of conversation around here about going paperless, back doctors going out of business, schools that have gone bookless, and the paperless office (which inspired me to ask Vance to write a blog on the lack of paperless office). Hopefully that will be up soon. I look forward to more of your post on this subject. What does your bag weigh today? I look forward to your updates! Hi Ann - I've been out of town at a meeting last couple of days - home later today. Will weigh the bag over the weekend and post here. 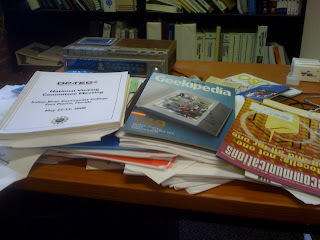 My experience at the meeting with the Kindle was interesting - will also write about that over the weekend and post.